Nose: We’re close to the ‘Blend’, only even drier and a little maltier. Hints of beer and soft spices (ginger, cumin). Just as austere, but these whiskies are probably not made for deep nosing. Mouth: Not very big at the attack but rounder and creamier than the ‘Blend’. Notes of beer again (gueuze, fruit flavoured Belgian beer), marzipan, quite some malt and the same kind of salty peatiness as in the ‘Blend’. Really warms up after a few minutes. Hints of kirsch. Finish: Medium-long, maybe just a tad too sugary but the peatiness blends well with soft spices and something slightly ‘oriental’ (orange blossom water). Aftertaste a tad too spirity. After reading this review I decided I had to try some Gold & Gold. Well, that proved very difficult, this stuff is hard to find. I checked every source of whisky I knew in the Yokosuka area, Yokohama and even Tokyo; I couldn’t find G&G on the shelf at all. Faced with failure and feeling desperate I asked a friend of mine that operates a small grocery store (that also sells booze) if he could order a couple bottle for me. He did and a week later it arrived. I picked up the G&G and that night I was finally able to taste this hard-to-find treat. First off, Serge Valentin’s review is spot on! 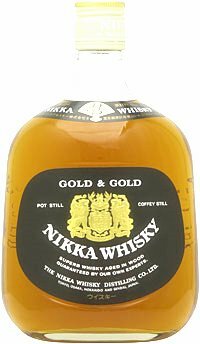 The only thing I can add is that the G&G reminds me of Nikka’s “All Malt” whisky; it’s a tiny bit on the sweet side. I dank it on the rocks with a splash of water and on a hot humid night it really hit the spot; vey satisfying indeed! I can already tell that I’ll be asking my friend to order some more for me in the near future. All-in-all, the hunt was fun, the wait was worth it and the whisky is a delight.